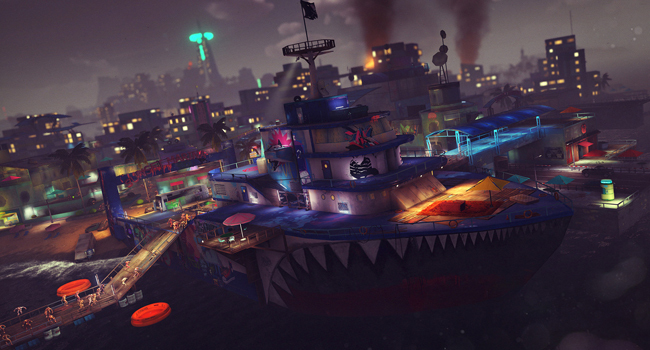 Despite Sunset Overdrive’s many successes, there are issues. For one, due to the hectic nature of the action, there's a tendency for the camera to get left behind. It's almost like there's so much going on that it's hard to know where to look. This is especially painful during the game's early hours, before the frantic control scheme has clicked sufficiently. 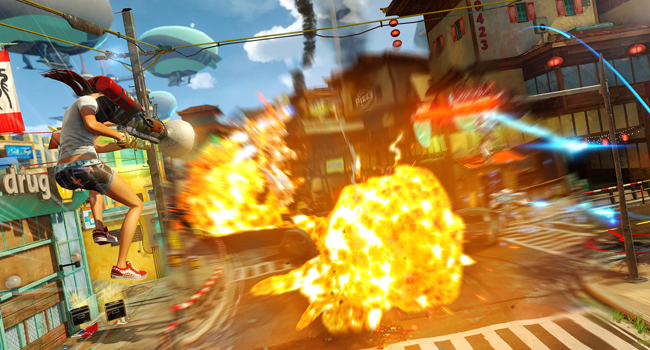 It leaves a feeling like you're never quite privy to the most outlandish explosions and moments of insanity that Sunset Overdrive delivers in spades. Night Defence base sieges – your means to cook up new Amps – are also rendered a blur, as hordes of enemies rush in leaving you turning in every which-way at once. Some players will praise the madness, while others will feel overwhelmed. One thing I can say for certain is that most won’t feel overly stretched, due largely to generous mid-mission save points that generally reward death by affording you respite and restocking your ammo. Injecting humour into any game comes with its own risks too. Sunset – with its knowing deference to industry clichés – did cause me to chuckle at times. That said, it also falls into the trap of repetitious one-liners. Certain boss fights cause the same staid barrage of quips to be spouted over and over. It got to the point that killing each boss became as much about stopping the jokes as it was about progressing to the next mission. The game’s length is a minor concern too, even if I’d argue that ten hours of campaign gameplay is a decent return. Any more and the story might well have outstayed its welcome like an overly long comedy. Completists will still find plenty of optional side-missions, challenges and Night Defence stages to finish off too. And then there’s the Chaos Squad multiplayer to contend with. This pits you, and up to seven buddies, against hordes of monsters across a random selection of the same missions you’ve already bested during the story. As you beat the missions you can raise the Chaos of the following missions to make the mutants stronger and the rewards richer. If you beat the final Night Defence stage, you’ll unlock cash and outfits that you can take into the single player. Hardly life changing stuff, but certainly diverting enough to tack-on a few more hours of entertainment. 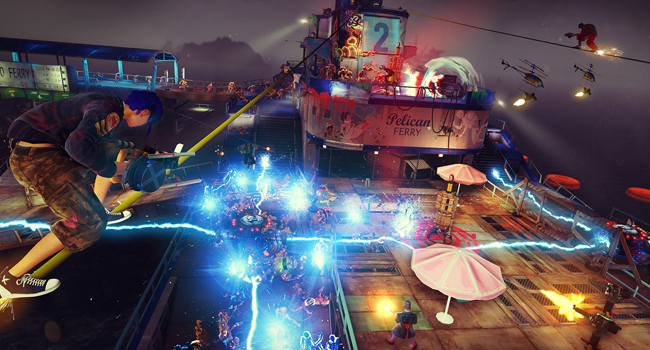 Sunset Overdrive, much like Infamous: Second Son, is going to divide opinion. Once more we’re left waiting for a much-hyped title to deliver that ever-elusive 'next-gen gameplay'. 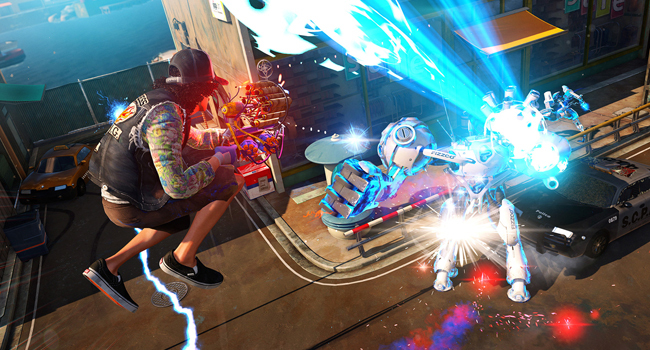 But, again like Infamous, it delivers more action and unabashed fun in an hour's play than most games manage in ten.